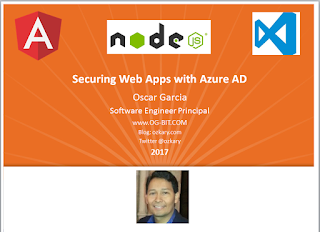 We take a Web application with an AngularJS SPA as client and NodeJS server with no security context, and we deploy it to Azure using a local GIT repository. We configure the Azure Application with Azure AD and show the different behaviors with forcing the users to Login or allowing anonymous access. We also discuss how to change a NodeJS server application and handle the security implementation in the server code. We finally show how to make the implementation changes on the AngularJS SPA to allow the application to directly integrate with Azure AD.